Two weeks ago I wrote a story about Zakimi Castle, residence of famous Ryukyuan warrior and fortifier Gosamaru. Long ago, there was a man named Gashi who served as Gosamaru's teacher. When Gosamaru moved his residence from Zakimi Castle in Yomitan to Nakagusuku Castle, Gashi, a loyal teacher, followed. He continued as Gosamaru's teacher until the latter was killed years later at the hands of Lord Amawari of Katsuren Castle. This week, I took a trip to Nakamurake, a Ryukyuan residence with a history dating back to the early part of the 15th century when Gashi followed Gosamaru to Nakagusuku. The style of Nakamurake is that of a rich farmer's residence of the time. After Gosamaru's demise, Gashi and his family suffered harshly under Amawari. It was not until 1720 when one of the ancestors was called to serve as a village headman by the Shuri royal government that good fortune returned to the Nakamura family. During that time, the first foundations of the Nakamurake were laid. 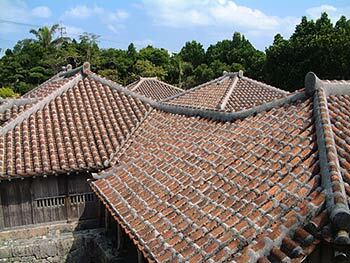 The roof of Nakamurake was originally thatched and was not covered with Okinawa's traditional red tiles until the time of the 7th generation. This shows the rising status of the Nakamura family since commoners' houses were restricted in size and appearance during this period of time. 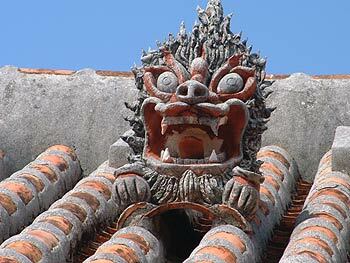 One of the most visible points of interest at Nakamurake is the shisa sitting atop the roof. Shisa are an Okinawa talisman believed to ward of unwelcome spirits and can be seen all over the island. Nakamurake's, however, is very unique in appearance. A huge stone slab called "Hinpun" sits just inside the gate and is also believed to prevent evil spirits from entering the residence. For further protection, the house is guarded from seasonal typhoons by surrounding Fukugi trees. The trees at Nakamurake are said to be over 250 years old! There are eight rooms in the main house of Nakamurake, each with a distinct purpose. The ashagi was the name given to an annex built to house the second and third sons until they were ready to form branch families, but this area was also used to accomodate visiting dignitaries and officials from Shuri. The building is really beautiful, both inside and out. Also, Okinawa cultural artifacts such as Awamori, Tsuboya pottery, and other artwork has been placed strategically throughout the house giving an even more genuine Ryukyuan appearance. The house is surrounded by a beautiful garden of trees. 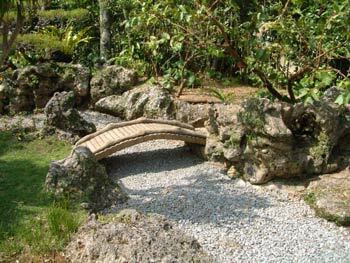 Though the residence is small compared to many of Okinawa's other siteseeing spots, I thoroughly enjoyed a pleasant stroll through the garden on a clear September afternoon. Nakamurake is really beautiful. It's also close to Nakagusuku Castle making this an ideal stop before visiting Okinawa's most preserved castle ruins. Nakamurake also has a giftshop with various Okinawan items such as Ryukyu glass, books, postcards, and t-shirts. Admission to the residence is ¥300 for adults, ¥200 for students ages 12 to 18, and ¥100 for children under 12. Driving to Nakamurake is very easy. If you are driving south on rt 330 from Okinawa City, turn left when Legion Club--also known as the Legion Gate--is on your right. Head straight and you'll see signs in English announcing the Nakagusuku Castle Ruins and Nakamurake. These signs will lead you directly to both of these great Okinawan siteseeing spots. For more information on Nakamurake, check out their website in English at www.imicom.or.jp/~knaka/ and in Japanese at www4.ocn.ne.jp/~knaka/.